Black Friday! We've got something for YOU too. 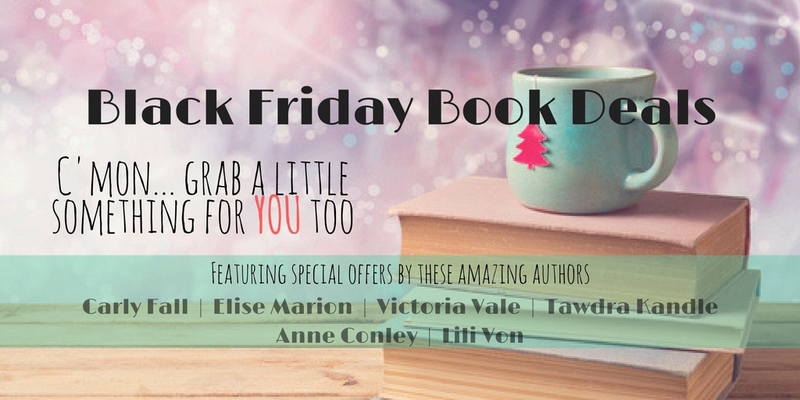 Anne Conley has put all of her books on sale for only .99 for Black Friday ONLY, so grab them while they’re cheap—from contemporary romance in small town Texas, to gripping romantic suspense in Austin, to the archangels falling to earth in Paranormal Romance, to her stand-alone novels. They’re all on sale! Stories of Serendipity, Pierce Securities, Four Winds, and the Book B!tches all have their prices cut way low to fill your e-reader with steamy reads to heat up your holidays. While fighting the War on Drugs in Guatemala, a unit of marines was involved in an accident that left them each of them with a supernatural ability. Follow their stories as they maneuver through the dangerous games of intrigue, secrecy and corruption to find safety … and love. In the war between Heaven and Hell, a special race of humans with supernatural abilities will represent the balance between darkness and light. They are known as The Guardians. Demon hunters Jack and Micah are dedicated to the cause of the Guardians, but their new mission is about to turn their lives upside down. Half-demon Naphil Addison Monroe needs protection; she’s been chosen by Heaven for an important mission. The darkness inside her goes against everything they fight for … and yet neither will be able to resist her magnetic pull. In the midst of a war pitting good against evil, two partners and best friends will also find themselves waging a war for Addison’s heart. When a peace treaty is broken between houses, Lady Gwendolyn Toustain takes Sir Caden Maginart as her prisoner, chaining him to the wall of her bedchamber. As attraction flares between them, they soon discover that a third party is responsible for inciting strife between their families. While working to restore peace to the realm, two mortal enemies will become lovers. Is their bond strong enough to overcome the hatred between clans? Set against the glittering backdrop of Regency era London, this series follows the scandalous behavior of Lords and Ladies. Expected to act with decorum and discretion in public, their private lives were stepped in scandal! Always For You (A Small Town Georgia Romance): Friends to lovers romance has never been hotter! Come back to Burton. The Last One (A Small Town Georgia Romance): He didn’t want her. She couldn’t stand him. Love doesn’t listen to logic. When We Were Us (A Keeping Score Football Romance): Three friends. Two loves. One choice. All’s fair in love and football. Tender Forces: Cassidy Barron’s divorce is final and now she’s poised to start a new life a continent away. Cassidy shouldn’t be surprised to see Ty Markson in the truck when her brother picks her up for a reunion with old friends at a civil war reenactment. What she doesn’t know is that Ty has plans for her, and those plans are anything but gentlemanly. All for Hope: Sometimes the safest distance between two hearts is no distance at all. Kidnapping a baby wasn’t something Hope ever dreamed she would do. But she’s been burned by the legal system before, so when the court places her friend’s child into the custody of an abuser, she takes matters into her own hands. Book Enthusiast Promotion Holiday Blitz! Check out these amazing holiday themed books!